Amanda Cleaves, PTA graduated from the Physical Therapist Assistant program at Kennebec Valley Community College in 2013. Amanda’s internships focused mostly on outpatient care as well as skilled nursing. Prior to receiving her degree as a PTA, Amanda became a certified Massage Therapist in 2006. Amanda owned her own massage therapy practice and worked locally with clients focusing on a variety of skills such as relaxation, headaches, but primarily chronic musculoskeletal issues. 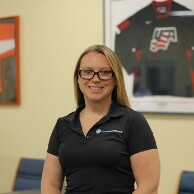 Amanda has continued to take continuing education courses including TMJ, shoulder, knee, and ankle specific courses, as well as courses focusing on postural dysfunction and respiration. Currently, Amanda has taken specific interest in vestibular therapy, balance, and concussion rehabilitation. She treats a variety of patients including post-operative care, chronic pain, and arthritic conditions and she also helps assist the clinic’s balance program. Amanda joined the Coastal Ortho team in 2013.